Despite hitting some areas held by Islamic State on Friday, Russian planes continued to pound for a third consecutive day areas in northwest Syria where the extremist group isn’t present. These areas are controlled by a mix of Islamist and moderate rebel factions as well as the al Qaeda linked Nusra Front. Hitting these areas is consistent with what appears to be Moscow’s main goal: bolstering the defenses of the western coastal strongholds of Syrian President Bashar al-Assad and his Alawite minority sect. The Kremlin has said its military had entered Syria to fight the Islamic State, but the Russian forces have concentrated much of their firepower on insurgent groups aligned against President Bashar al-Assad, including the Nusra Front, Al Qaeda’s affiliate in Syria, and relatively secular groups like the Free Syrian Army. Rival insurgents say that the Islamic State, also called ISIS or Daesh, is taking advantage. While it is true that Russia’s actions are feeding into the remaining integrity of the Assad regime, Moscow’s insistence on attacking the general Syrian armed opposition adds another dimension to its campaign. By targeting the middle (i.e. anyone not part of ISIS or the Assad regime), Russia is leaving the Syrian populace with two options, ISIS and Assad. In Russia’s eyes, those wanting to evict ISIS, pairing up – or at least tolerating – the Assad regime would become an attractive option. And that could (in Moscow’s hopes) end this war. As I had written above, Russia is not pulling any of its punches. On October 1st the Russian Ministry of Defence announced that the Su-34 Fullback, a dedicated long-range strike fighter, would join the 28 combat aircraft already deployed in Syria. According to IHS 360 Jane’s, 4-6 Su-34s had been deployed to Syria by October 2nd. 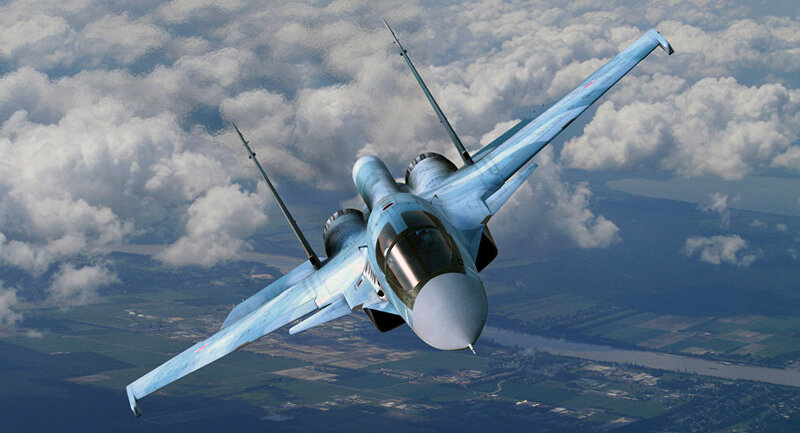 The Su-34 is a derivative of the venerable Flanker-series (i.e. Su-27/30/35), but incorporates significant design alterations to make it suitable for very long-range flights. The Sukhoi Su-34 Fullback. Four to six aircraft were deployed to Syria. Photo via Sputnik International. For example, the aircraft’s cockpit layout is side-by-side (like that of a bomber), as opposed to tandem (like the Su-30M, which is also in use in Syria). In fact, unlike its sister-derivative the Flanker, the Fullback’s cabin has enough overhead space behind the seats to enable the pilots to stand up and move (albeit to a very limited extent). While advances in technology often get the limelight in military analyses, it is important to account for the impact of human limitations such as focus and fatigue. The Su-34’s cockpit layout can enable pilots to maintain their operational efficacy for extended periods of time, a necessity when required to engage distant targets within a single sortie. By virtue of being a derivative of the Flanker, the Su-34 has a level of commonality with the Su-30M, enabling Russia to streamline its maintenance and logistical support channels. This is a key advantage, especially in expeditionary missions where the supply of spare parts can be tenuous (compared to being based at one’s homeland) and where manpower efficiency and flexibility are of tantamount importance. The crews supporting the Su-34 and Su-30M are largely familiar with their respective sister platforms, thus enabling one to assist the other when necessary. Although capable of air-to-air warfare, the Fullback is a strike-oriented platform, and as such it can be equipped with a wide range of air-to-surface precision-guided munitions (PGM). 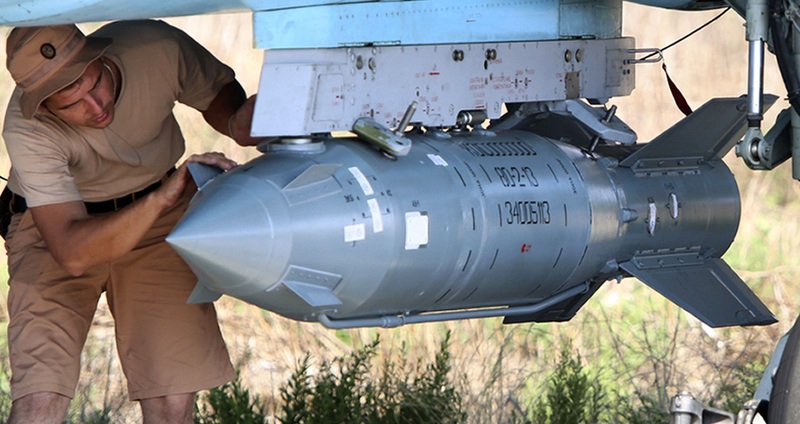 In Syria, the Su-34 was spotted using the KAB-500S PGM, a 500kg satellite-aided (via GLONASS) bomb similar in concept to the American Joint Direct Attack Munition (JDAM). It is unclear if the Russians will use stand-off air-to-surface missiles such as the Kh-59ME or Kh-31. It is conceivable that it could happen if the Russians decide to hastily engage distant (relative to the take-off positions of their fighters) targets, but for now, it seems that role has been taken on by the Russian Navy and its arsenal of land-attack cruise missiles (LACM). According to the Russian Ministry of Defence the Russian Navy fired 26 LACMs at 11 targets (IHS Jane’s 360). The Kalibr LACM has – according to the Russian Defence Minister – a range of 1500km. The Kalibr is basically a 3M-54E anti-ship missile equipped for land targets. This is achieved by equipping the missile with an inertial navigation system. For a better understanding of what this technology is, be sure to review Quwa’s piece on precision strike and anti-ship missiles to see how this technology works and why it is important). Based on the video footage released by the Russian Ministry of Defence, the LACMs were fired from a Gepard-class frigate and a Buyan M-class corvette. Although light combatants at 1930 tons and 949 tons respectively, the Gepard and Buyan M were designed to be modern but affordable littoral (i.e. close to the coast) defence and patrol ships. The Gepard and Buyan M are both equipped for anti-ship warfare as well as for protection against incoming missiles (through the use of close-in-weapons-systems). That said, by being able to engage distant targets in Syria, the Russians have demonstrated that these ships – despite their littoral and low-threat focused designs – are not to be taken lightly, especially by those who lack any form of genuine naval capabilities. With a comprehensive set of naval and aerial assets being committed to fighting in Syria, it is clear the Russians are looking to achieve a series of significant military objectives. Among them, the utter deprecation of the Syrian opposition (with the apparent exception of ISIS, for now). It will be important to see if Russia’s breadth of involvement grows (given how the Russian Navy just entered the fold, could the Russian Army join as well? Could additional Russian Air Force units be deployed?) moving forward.